Kia is to introduce a third production shift at its European production facility in Slovakia and recruit 1,000 new employees to keep up with rising demand. Recruitment will be completed by December to allow three-shift operations at Zilina in the first quarter of 2012. "The creation of the third shift at Zilina is the latest step in Kia's long-term process of building cars locally to best meet local consumers' needs and tastes," commented Paul Philpott, Chief Operating Officer, Kia Motors Europe. "Strong demand for all our models and especially our new Sportage compact SUV, made here in Europe, means we need to significantly increase production at our Slovakia facility." Representing an investment of more than Euro 1 billion, the ultra-modern Zilina plant is designed for maximum flexibility to accommodate new models and respond to fluctuations in overall market trends. 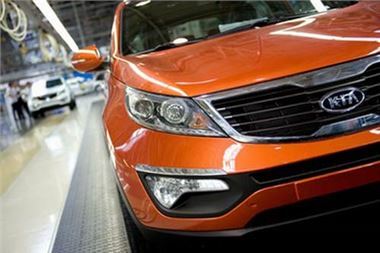 The Sportage, spacious Venga MPV and cee'd family - five-door hatchback, estate and three-door - can be manufactured simultaneously on each of the final assembly lines. Last year, Kia manufactured more than 729,000 vehicles outside Korea, with production in Europe, China and the USA accounting for 34.2 per cent of the global total of 2.1 million units. This year sales have climbed 18.7 per cent in Europe, 24.4 per cent in China and 36.9 per cent in the USA. Increased US demand prompted a third shift at Kia's West Point, Georgia, plant building Sorento and Optima, boosting employment to 3,000. In Zilina, the 1,000 new jobs at Kia Motors Slovakia will be across all stages of the manufacturing process and will be suitable mainly for skilled candidates with a technical background. It is also expected that several thousand new jobs will be created at component suppliers located across the Slovak Republic.